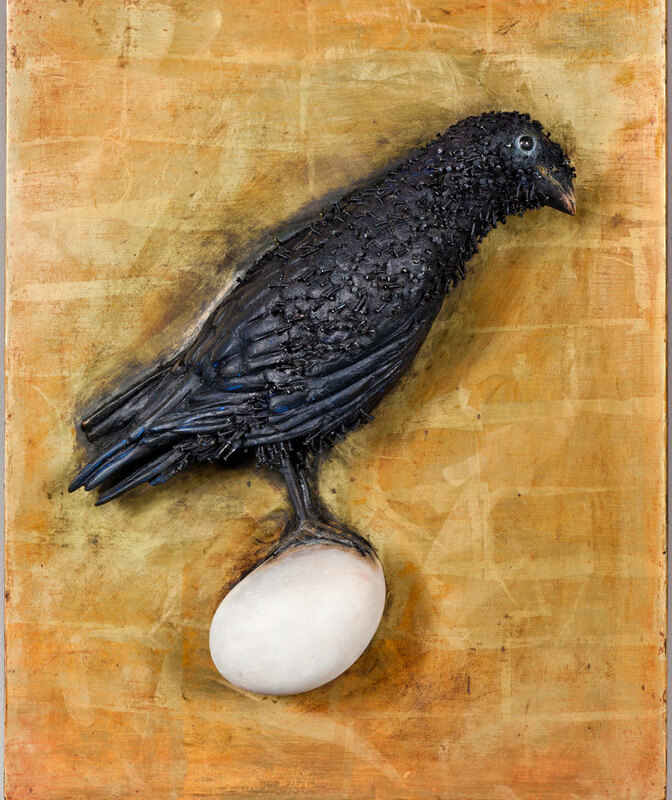 Ana Maria Pacheco is best known for her sculptures in the round, but even before coming to England in 1973 she had made a relief that still adorns a building in her home town of Goiânia. Before her residency at the National Gallery in London (1997-2000), Pacheco made two stone reliefs of scenes from the life of Macunaíma, the eponymous, shape-shifting hero of Mário de Andrade’s novel. Later, having been inspired during the residency by the formal qualities of early Renaissance painting, she embarked on a series of reliefs in alabaster from which ‘The Turning World’ has emerged. The three reliefs are a meditation on the cycle of decay and renewal. The owl and crow have long associations with death. 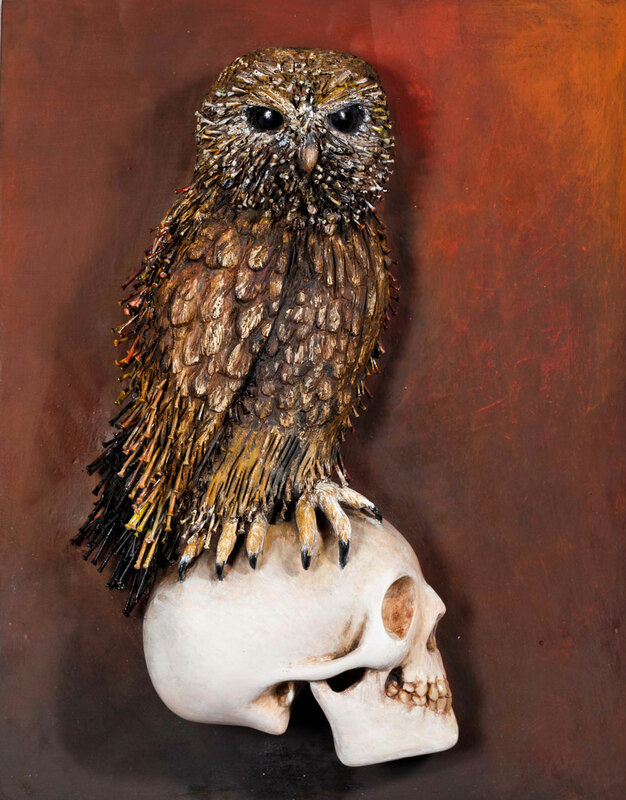 Here, the owl’s skull-perch echoes the warning inherent in vanitas paintings of the seventeenth century, while the crow’s egg-perch signals renewal. 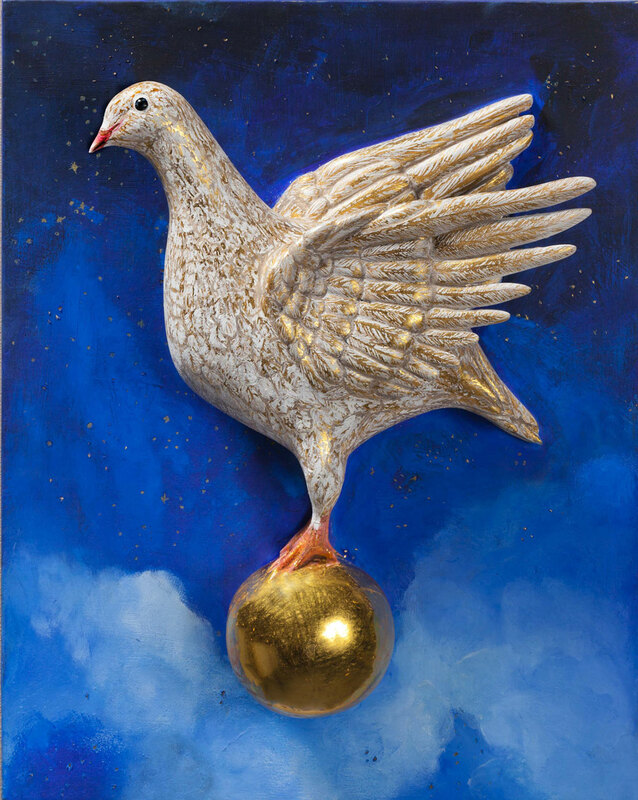 In the third piece, the dove, symbol, among other things, of the immanent spirit, perches in triumph on a gleaming golden globe. Each relief has been carved to great depth, the foreground figures and objects projecting in almost three dimensions from the background. The rich painting and gilding of the wood and the use of polished stone for eyes are hallmarks of Pacheco’s sculpture. The same is true of her use of nails, but here their metallic hardness and sharpness somehow manage to convey not just the delicacy of feathers, but the spiky menace of owl and crow. A tour de force.